The pre-meet press conference for this year’s European Athletics Championship in Berlin was hosted at an old but quite spiffy-looking brick building called the Königliche Porzellan-Manufaktur or, “Royal Porcelin Manufactory.” It is, apparently, the oldest business in Berlin, having been founded under the auspices of the great warrior-king Frederick the Great in 1763. The press conference included some important folks such as Svein Arne Hansen, the president of European Athletics, and defending World Champion athletes Sandra Perkovic and Kirsten Warholm. But by far the biggest bull in this porcelin shop was the two-time World Champion in the shot put, David Storl. David has been so good for so long (he won his first World title in 2011) that it is easy to think of him as a grizzled veteran even though he just turned twenty-nine years old. Adding to that impression are the struggles he has had with injuries over the past four years, struggles that have at times have made him look almost frail (I’m thinking of his difficulty staying balanced as he set up his glide at the back of the ring at the Rio Olympics) when compared to the almost savage power and explosiveness he displayed as the enfant terrible of the shot put world. Remember, this was a young man who, from 2011 to 2013, sandwiched an Olympic silver between two World Championship golds—while still in his early twenties. But a knee injury first sustained during the 2014 outdoor season caused him to abandon his trademark violent reverse and become an almost exclusively fixed-feet thrower. In spite of changing his technique and having to manage nagging pain in his knee, David produced some fine throws during his four seasons as a non-reverser, including a PR 22.20m in 2015. But he clearly was not himself much of the time, and did not get near the podium at an Olympics or World Championship from the time of his injury until the recent Indoor Worlds in Birmingham where he took silver using what looked to me like his old, pre-injury technique. In talking with David and his new coach Wilko Schaa today, I was curious to discover whether or not we might one day see a return of the old/young firebrand who, along with 2008 and 2012 Olympic champion Tomasz Majewski, managed to keep the glide relevant in an era dominated by rotational putters. Below is a slightly edited version of my conversation with each of them. McQ: David, you’ve gone back to your old technique with a full reverse at the finish. Does this mean you are finally over the knee problems that caused you to become a fixed-feet glider? McQ: It took four years to finally feel healthy, eh? David: Yes. It was a long way, but it was a decision of mine, and that’s the most important thing. If I didn’t change the coach I think I will have the old technique still. McQ: Are you more confident using your old technique? McQ: Because it helps you stay in the ring at the finish of your throw? David: No, that’s not the reason. It feels complete. If you do not jump, you have to stop the movement. Not a nice feeling. McQ: Was it a strange experience to change coaches after working with Sven Lang for so long? David: Yes, because we worked nearly ten years and was a long way and I had a lot of success with him. But now I go my own way. McQ: How long have you known Wilko? David: I know him since 2010. McQ: Wilco, how did you end up coaching David? McQ: Did you feel pressure over the prospect of taking over his training? Wilko: A bit, yes. He is a big athlete. He has won twelve international medals. It is an honor for me to work with him. And now we work ten months together and I think we are in a good way. We won in Birmingham a silver medal, and it was a bit surprise. 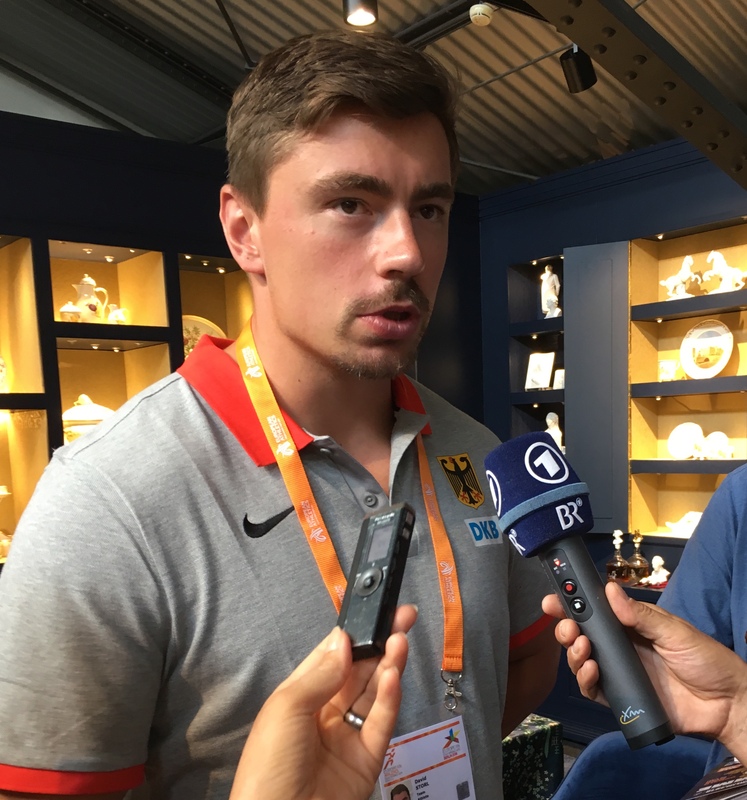 But now we are in a good way and I think we will take the gold medal [this week in Berlin]. McQ: David says that he was able to go back to his old technique because his knee is finally feeling healthy. Wilko: Yes, that was the first thing we had to do. A healthy knee then change to his old technique. McQ: So that was the plan right away? See if you could fix his knee and then go back to his old technique? McQ: How did you do it? How did you make his knee feel better after four years? Wilko: We changed the training system. We had good regeneration management. We trained static to build all the muscles around his hip and knee for stabilization so the knee can become healthy. McQ: And it worked well? Wilko: Fast! Very fast. I thought the first year would just be for health and getting in shape, but now we are in a good way. McQ: How long did you train together before he was able to do his old technique? Wilko: A month. From the beginning we tried to do this. McQ: It must have been an exciting moment when he felt well enough to try reversing again. Wilko: Yes, it was an experiment. It was trial and error, but we have a good relationship so I hear his feedback. He gives me a lot of feedback and I try to adjust the training. It is very individual. Very, very individual. He is the only athlete I coach. He is a great athlete and I think it is good for him. McQ: Is he as strong as he was when he was World Champion? Wilko: That is a good question. I think yes. McQ: So he’s strong enough to throw twenty-two meters? Wilko: Yes. I think he will have to throw twenty-two meters to beat Michael Haratyk or Tomáš Staněk. Konrad Bukowiecki can also be dangerous. He can be a big surprise. He is very strong. McQ: And it will get even harder in Tokyo with Tom Walsh and Ryan Crouser. Wilko: Yes, I think it will take 22.50m to 23.00m to beat those guys. The men’s shot put performance progression in the last years, I don’t think will stop between now and the Olympic Games. It will go on. But they are all good guys. They are very funny, and we like them. McQ: Does it feel strange to coach the only glider who seems capable of medaling in an international competition? Wilko: He’s the last Mohican! We talked about the rotational shot put. We talked about the possibility to change the techique, but we agreed it is not good for him. Rotational shot putters are a different type of athlete. We tried it in training. When we warmed up he threw it. It was fun and provided variation. But, he’s a glider. McQ: What is it about David as an athlete that makes him a glider? Wilko: He is very tall. He has amazing power. And he is very stiff in his legs. When he comes from the glide, it is amazing how he can stop the whole center of mass of the body and transformate it into the release. I have never seen this. Maybe in the 1980’s with Ulf Timmerman, but in the 1990’s and 2000’s, nobody else was able to do this. McQ: I love the glide, so I hope you medal in Tokyo. Wilko: I love the glide too, but I think it will go out. McQ: In America, it is pretty much gone. Wilko: With athletes, there are different types, and that’s why I think the glide is still good. You can with the glide reach the same performance as the rotational, but you have to be the right type of person with the right abilities. McQ: So you don’t believe that the rotational technique provides an advantage? Wilko: No. You have to look which person is right for which technique. It is difficult. McQ: It seems like most rotational shot putters are built differently than the best gliders. Wilko: Yes. Rotational shot putters look like this [ He outlines a refrigerator shape with his hands]. Gliders, like this [He raises his hand high to demonstrate tallness]. Note: I want to thank Wilko and David and pretty much every other German I have spoken with for being gracious enough to speak in English to me. I feel spoiled that I can come to their country without being able to speak a word of their native language and have them go out of their way to use my language—which is not easy when you are not used to discussing throwing technique in a foreign tongue. I would also like to thank the German school system for emphasizing English. The men’s shot put prelims will take place Monday evening at a temporary venue set up in downtown Berlin. Unfortunately, the men’s hammer prelims will be held at the same time inside the Olympic Stadium, so spectators will have to choose which one to attend. I’ll be at the shot, where I hope to witness the beginning of a glide renaissance. Hi Dan, did you mean a PR of 22.20? Rather than a PR of 20.15? My mistake! That’s what I get for writing sober! No worries! Love them posts, keep em coming!